There is no “cloud” without the network. You can’t get there from here. Telecommunications is a core pillar of smart city infrastructure and requires an ecosystem of public-private cooperation to maximize its impact. Cities that actively engage in creating a connectivity-friendly environment and develop sound broadband strategies can deliver significant benefits to their citizens. It is no longer necessary to convince cities that connectivity is vital. The challenge is in funding and executing. Network construction is capital intensive and requires an operating budget each year. Maintaining networks requires specialized equipment and skillsets most cities are not budgeted to support. A collaborative approach among all ecosystem stakeholders has proven to be successful. Policy models exist that have been driving investment and growth. 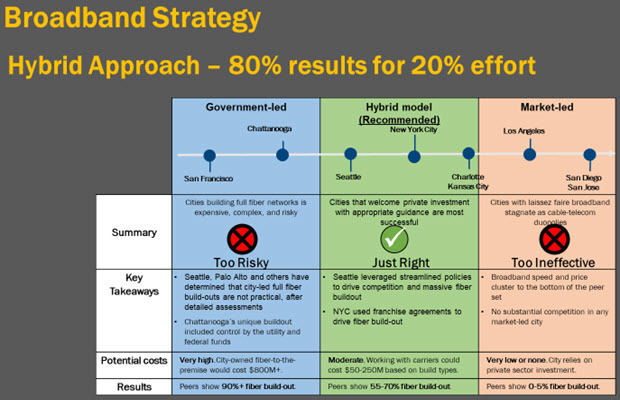 The City of San Jose, California, provided this look at their broadband strategy for the Smart Cities Council event in Silicon Valley in the fall of 2017. Municipal leaders looked at how to ensure broadband connectivity was ubiquitous and affordable. Their model projects the benefits of collaboration between the public and private sectors. Increased broadband and collaboration also led to new capability. San Jose developed a Demonstration Partnership Policy, which was established to support its economic-development strategy and city operations. Under this policy, the city worked with Philips Corp. on a SmartPole pilot project for wireless infrastructure. Philips deployed 50 SmartPoles, with energy-efficient, wireless-controlled LED lighting, which should provide the city with a 50% energy savings compared to conventional streetlights and prepare for future Iot applications the city may choose to deploy. The city also is working with Council Global Lead Partners AT&T and Verizon on a citywide wireless communications upgrade to improve its first responders communications network, provide internet access for low-income residents, open the door for more applications to help the city achieve its Smart City Vision goals and prepare for next-generation 5G mobile technology.